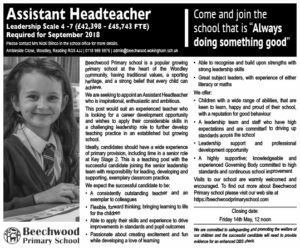 Beechwood Primary school is a popular growing primary school at the heart of the Woodley community, having traditional values, a sporting heritage, and a strong belief that every child can achieve. We are seeking to appoint an Assistant Headteacher who is inspirational, enthusiastic and ambitious. This post would suit an experienced teacher who is looking for a career development opportunity and wishes to apply their considerable skills in a challenging leadership role to further develop teaching practice in an established but growing school. Ideally, candidates should have a wide experience of primary provision, including time in a senior role at Key Stage 2. 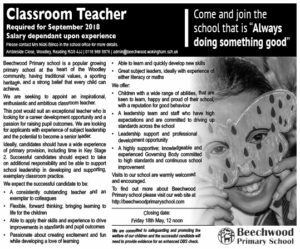 This is a teaching post with the successful candidate joining the senior leadership team with responsibility for leading, developing and supporting, exemplary classroom practice. We are seeking to appoint an inspirational, enthusiastic and ambitious classroom teacher. This post would suit an exceptional teacher who is looking for a career development opportunity and a passion for raising pupil outcomes. We are looking for applicants with experience of subject leadership and the potential to become a senior leader. Ideally, candidates should have a wide experience of primary provision, including time in Key Stage 2. Successful candidates should expect to take on additional responsibility and be able to support school leadership in developing and supporting, exemplary classroom practice. We are committed to safeguarding and promoting the welfare of our children and the successful candidate will need to provide evidence for an enhanced DBS check.